As a Winston-Salem native, coming to Wake Forest meant I already knew the city and the best places in Winston-Salem to hang out and eat. Plus, whenever someone needed something, I became the go-to guy because I already had all the recommendations and knew where they should go. So now as a junior, I hope to keep passing on my insider knowledge and help the class of 2021 see the wonderful city of Winston-Salem from one of the many Winston-Salemites at Wake Forest. In the past few years, downtown Winston-Salem has been referred to as up-and-coming. With Wake Downtown opening earlier 2017, the Innovation Quarter opened doors for Wake Forest students with various opportunities to escape the Wake Forest Bubble. Downtown has everything you will need: food, music, study spots and art. There are countless places that have all kinds of food that will make even the pickiest freshman happy. From small quirky coffee shops to well-established restaurants, downtown has it all. While Mellow Mushrooms pizza is renowned, my favorite restaurant is Mooneys. It’s a must visit for sure. Mooneys had Mediterranean and Middle Eastern cuisine with large proportions and even larger taste that won’t kill your already broke wallet. After a delicious dinner, the Arts Park is right around the corner to not only see some new art, but to get some amazing photos for your Instagram. Beyond this, you can usually find a cool film at the Aperture Cinema, and gallery hopping is a big thing on Trade Street. Both of these activities can be a lot of fun to do with a group of friends or alone. It’s just really fun to see the more artistic side of Winston-Salem. In the downtown area everything is concentrated around Trade and Fourth Street, so be sure to check out those two streets when exploring. After some exploring downtown there is the infamous Target that is a must visit. Not only is it close to campus but it’s almost impossible to not see another Wake Forest student while shopping there. Four or five blocks up is the Grand Movie Theater, and then past that is one of the two must visit Cookouts near Wake Forest’s campus. Don’t know what Cookout is? Well, get ready for a visit in the middle of the night and have some mad good milkshakes and greasy food for absurdly cheap prices. Then in the morning get some more greasy food at Waffle House, a southern classic. Another option is the weekend staple Bagel Station, which is where half of Wake Forest goes for breakfast on Sunday morning. On the topic of food, a must-visit restaurant is Nawab. Nawab is an Indian restaurant that changed my life. And they have a just astounding buffet lunch that everyone should definitely check out. I can proudly say that weekend Indian brunch has been a staple of my college career. The Porch Kitchen and Cantina is also a classic favorite for many Wake Forest students. Their interesting spin on Tex-Mex will leave your taste buds watering for days. When your parents come to town and your dining budget instantly increases for that one weekend, Milner’s American Southern, Fourth Street Filling Station, Fratelli’s Italian Steakhouse, Sweet Potatoes, Spring House and Ryan’s Restaurant are all great options for some high-quality dining. If you’re wanting to take your mom out to a nice brunch before she leaves, check out Midtown Cafe & Dessertery, Mama Zoe’s or Mozelle’s Fresh Southern Bistro for delicious food in an environment that radiates southern hospitality. But I have been centering most of this article around food, so to fight off all these delicious calories as well as the Freshman 15, some exercise will definitely be needed. The best way to do that is by exploring North Carolina hiking paths. North Carolina mountains and their trails are something people travel from all over to come enjoy and your prime location in Winston-Salem gives you easy access to them all. A short, 30 minute drive north will take you to Pilot Mountain State Park. You must check this out before you walk across the graduation stage, even if you don’t particularly like hiking. Its an easy trail with amazing views and some great photo options. Another popular hiking trail for Wake Forest students is Hanging Rock State Park. The park is only a 45 minutes from campus and you can get the iconic photo of you “hanging” from the rock, which I think is on every Wake Forest student’s Instagram. 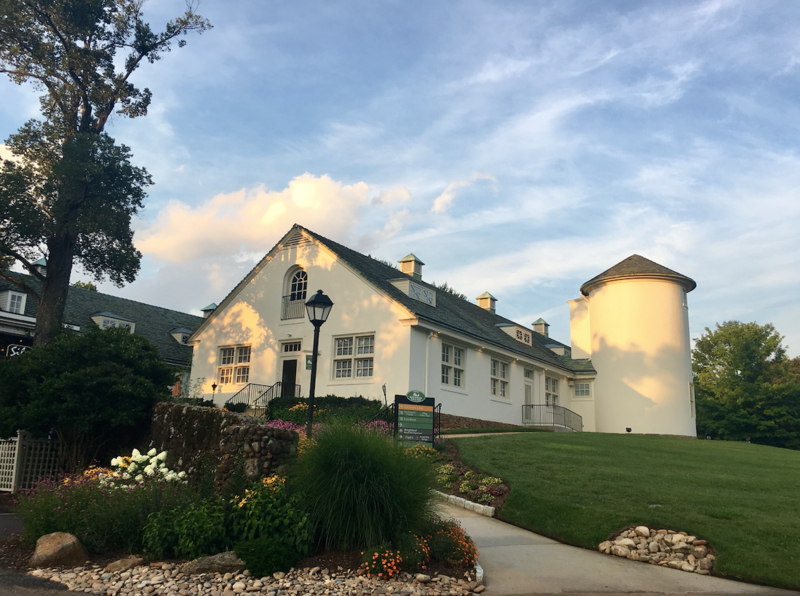 Yet, if you maybe don’t have a car and are looking for something a bit closer to campus, Reynolda Village is a great place to explore. The village is within walking distance and is accessible by the Reynolda Trails right behind the Winston and Salem science buildings. The village has everything you need, including great restaurants like the Village Tavern and Silo, cool boutique shops like Boho Blue and Monkees, and workout places like Pure Barre and Yoga Dogz. So no matter your interests and passions, Winston-Salem has a lot to offer. For my final recommendation, I advise you to save your Monday nights in order to visit Dewey’s Bakery and get some of Winston-Salem’s famous sheet cakes for free and then walk down to Juice Shop and get a Razamatazz to cool off from the fall heat of Winston-Salem.